Realize business value faster from your investment in Microsoft Dynamics 365 Finance and Operations with AXIO technology. AXIO improves implementation and management of Dynamics 365 Finance and Operations. Building on the automation capabilities of Microsoft Lifecyle Services (LCS), AXIO can reduce total cost of ownership by 50% or more — virtually eliminating custom code in core financials and the resulting manual processes that inflate the cost and complexity of implementation and the ongoing management of feature updates. Building on the automation capabilities of Microsoft Lifecyle Services (LCS), AXIO can reduce total cost of ownership by 50% or more, virtually eliminating custom code in core financials and the resulting manual processes that inflate the cost and complexity of implementation and feature updates. Download the feature sheet to learn more. AXIO is based on a library of Process Model Packages – pre-developed, best-practice deployments of business processes in Lifecyle Services. Packages are managed, fully configurable and designed to automatically transition with feature updates. Process model packages consist of four elements – a Business Process Model with associated Data Package, Regression Test Case and Learning Path Content. Our library of over 350 Process Model Packages spans all the financial processes in your business, providing pre-developed functionality for the core financial modules of Dynamics 365 Finance and Operations. Traditional implementations require significant time and investment in consultation and business analysis to ensure that business processes are accurately defined and documented before an implementation plan can even be scoped and developed. 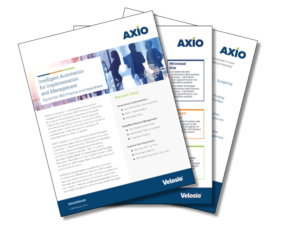 AXIO-enabled implementations are fundamentally different than traditional ERP projects because we start with a functioning financial system and leverage Agile Development principals to rapidly tailor your solution. Microsoft publishes twice yearly feature updates for Dynamics 365, requiring testing of all customized processes and integrations. With AXIO, feature updates are accelerated by the automated management of Process Model Packages and Regression Test Cases, as well automated update of all Learning Path Content. In addition, Velosio Customer Care Services are designed to integrate with Lifecycle Services for a seamless support experience.